Image courtesy of The Guidance Center. 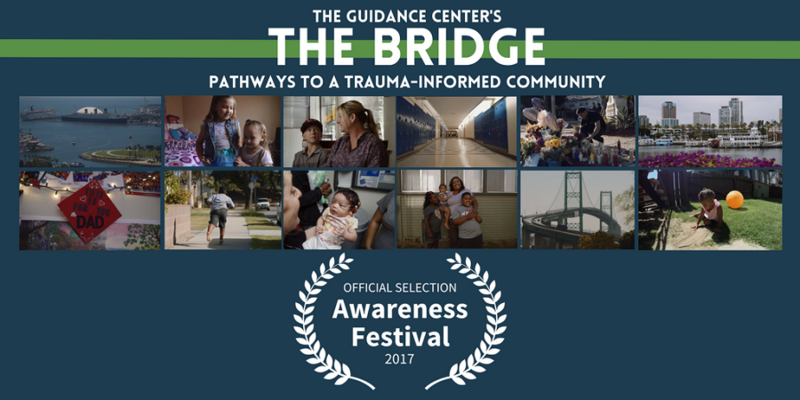 The Guidance Center’s documentary, “The Bridge: Pathways to a Trauma Informed Community,” has been selected to screen at the 2017 Awareness Film Festival this month, it was announced. The documentary is scheduled to screen at L.A. LIVE REGAL this Saturday at 2:00PM. “The Bridge: Pathways to a Trauma Informed Community” was produced by Emmy Award-winning filmmaker, Matthew Murray, and The Guidance Center’s CEO, Patricia Costales, LCSW. The film challenges perceptions of poverty, and shows its devastating effects on mental health and how the trauma-informed approach can be a part of the wider solution to breaking poverty’s intergenerational cycle, according to the release. The film explores living in poverty and the issues that often come along with it, including housing instability, food insecurity and inadequate access to resources. Many children growing up within these circumstances lack the security needed for healthy emotional development and general welfare, according to National Child Traumatic Stress Network (NCTSN). The Bridge tells the story of shared human experiences with poverty in two different cities, Long Beach and Avalon on Catalina Island. Six different families striving to break their poverty cycle, as well as 11 community leaders working to revolutionize the way institutions approach poverty, are interviewed. “[…]facts are humanized, numbers are turned into the faces they represent, and viewers are empowered with a trauma-informed lens in which to see those affected and help positively change the course of people’s lives for generations to come,” stated the release. The documentary was first screened in April at The Art Theatre in Long Beach during which city health officials and educational leaders discussed the issue. Awareness Film Festival, which runs October 5 to October 15, showcases works of film on ecological, political, health, well-being and spiritual topics with the mission of informing and inspiring audiences. The festival is presented by and serves as a fundraiser for Heal One World, a nonprofit supporting community surrounding West Pico Boulevard in Los Angeles. Tickets for the film festival are available here.